Authentic BURBERRY BLUE LABEL Jacket Wool Ladies [Used] Black Coat Buttons Cute! Burberry Jacket. It is Like new shape. Never worn. The waist strap is included. No reserve. Burberry ladies white rain jacket. Full Sleeve Length:30. No size listed. Pit to Pit:20.
burberry golf women fleece jacket Xl. Condition is Pre-owned. Shows some signs of wear but still has lots of life left. Please ask any questions! Great versatile jacket. Shipped with USPS First Class Package. This is 100% authentic Burberry dark red quilted jacket. The jacket is in new condition, only tried on. It has two extra buttons. It’s not noticeable unless you look for it. 100% Wool. Fully Lined. Beige Color. Gold Buttons. Item in good pre-owned condition, no flaws. Dry cleaned. Arm pit to arm pit 19". Condition is Preowned. Worn v e r y f e w t i m e s. Light makeup o n t h e c o l l a r. Could c o m e o f f w i t h a d r y c l e a n. V e r y l i g h t not real noticeable. S m o k e a n d p e t f r e e h o m e.
Color: Grey. Center zip. Doing that is against U.S. and international laws. Pickup hours. Burberry coat women. Condition is Pre-owned. Shipped with USPS Priority Mail. Good condition. 80% wool 20% cashmere. No major defects except slightly worn around the pocket on the left side and sleeves. Please look at picture 5 and 7 as it shows the defects I’m referring to. There are no rips of any sort on the lining but keep in mind that this is a used coat and it’s not in perfect conditions. Hence the low price. Happy shopping! 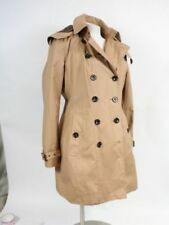 New ListingWOMEN'S PREWORNED BURBERRY OVERSIZED SINGLE BREASTED TRENCH BEIGE US 10/M. Condition is Pre-owned. Reminder: Condition is Used ( Good ). 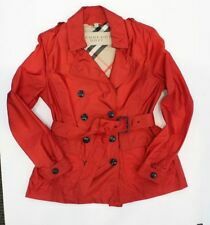 Women's OrderPlus Trench Coat-Size S. Condition is New with tags. Shipped with USPS Priority Mail. Is light weight, regular silhouette, 5 front snap Burberry buttons and reverse Burberry check is on the jacket collar and cuffs reveal the check when folded back. Perfect for Spring and Fall. Excellent used shape with exception of tear in sleeve as pictured. Condition is Pre-owned. Spread collar with snap front. Long sleeves with snap tab at each cuff. Slim silhouette fitted with back tab belt. Vertical zip pockets. White Burberry Blazer Size 4 US Peplum Waist. Condition is Pre-owned. There is a dime-sized spot on the front. I haven’t tried to remove it. See photo Shipped with USPS Priority Mail. Having huge clear out. 100% Authentic. 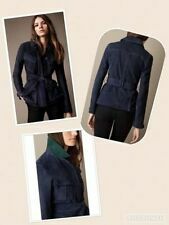 Women's Burberry Coat Size M in navy blue. Condition is slightly used with no defects. Enjoy free shipping. Burberry Raincoat Size 2. Condition is Pre-owned. Shipped with USPS Priority Mail. No zippered wool lining. Poly Cotton with Classic Nova Burberry Plaid Cotton Lining. Length is 46". Size 18 Long. Chest size is 48". 99% of the people I have dealt with are wonderful! Soft smooth satiny lining in the sleeves. 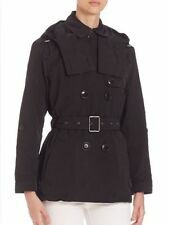 New ListingWOMEN'S PRE WORNED BURBERRY RAIN TRENCH JACKET BLACK PETITE L / US 8. MINT COND. THE CONDITION IS EXCELLENT! PLS CHECK CAREFULLY BEFORE BUYING. PETITE SMALL / US 4 approx. PETITE LARGE / US 8 approx. Size Armpit - Armpit Top - Bottom Shoulder Sleeve. 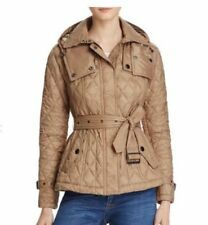 Burberry Women's Quilted Jacket. Condition is Pre-owned. Shipped with USPS Priority Mail. Light Wear! Polyester Shell with Cotton Lining.Lightweight Coat. COAT LOOKS GOOD! Condition is Pre-owned bit in excellent condition. Enjoy this amazing spring jacket! Up for sale is a pre owned Burberry Double breasted trench Coat. This item is in execellent shape and have no flaws, stains or tears what so ever! This item is authentic or money back! Size Armpit - Armpit Top - Bottom Shoulder Sleeve. Authentic Burberry Women’s Quilted Jacket Size Small. The tag that’s states the size fell off from wear, but it’s a size small, used condition but still in a great shape. Ask question before buying, sales are final. Shipped with USPS Priority Mail. NWT BURBERRY WOMENS HERITAGE QUILTED CHECK COAT JACKET SZ SMALL. Condition is Pre-owned. Excellent condition used a handful of times, too small for me after Pregnancy. Shipped with USPS Priority Mail. Really cute, excellent condition,has been professionally clean, navy blue, quilted plaid lining, plaid cuff sleeves, zipper front. Made in England! Authentic BURBERRY Coat Jacket LONG full length Size XS Black Used 1 Time. Condition is Pre-owned. Shipped with USPS Priority Mail. Zipper needs fixing. Pic #6 is a pic of INSIDE the pocket. Down filling feels and looks great to the touch/eye. Condition is Pre-owned. Auth BURBERRY LONDON Women’s Vest- Size XS. Shipped with USPS First Class Package. Condition is Used. I bought this coat at a Burberry sample sale a few years ago. Burberry embossed on all the buttons. It’s a size 8, this is not displayed on the coat as it was a runway sample. Burberry belted puffer coat. Size Large. Detachable hood and belt. Very warm and cozy. Beautiful beige fabric goes with everything. Inside lining is classic Burberry plaid. Pre-owned but in great condition. Ships to US addresses only. No returns or refunds. A neatly tailored diamond quilted jacket – turn back the cuffs or turn up the collar to reveal the Burberry iconic check. Excellent condition. The back two buttons were replaced because my daughter lost the original ones. BURBERRY CLASSIC TAN SHORT JACKET SIZE LARGE . GREAT LOOK FABULOUS AUTHENTIC . total length 26", under arm to under arm 24 1/2", waist 22", sleeves 24". Made of 60% NYLON, 27% COTTON WITH POLY, dry clean. When there's a chill in the air, a Burberry women's jacket or vest can keep you warm. Jackets look great as an outer layer, and they can easily be matched with a variety of clothing. There are many new and used Burberry quilted garments available on eBay. What are quilted jackets and vests like? Quilted puffer vest - This vest is like a classic Burberry quilted jacket in that it has the brand's signature check-print lining, side slit pockets, and front concealed snap closures. The stand collar has faux-fur trim to keep your neck warm. The quilting is found throughout the vest, and there's a V-shaped stitching design just behind the back of the neck for some added visual interest. Quilted Skye vest - This product also has a snap front and quilting throughout. It has a hooded neckline and an equestrian knight logo. 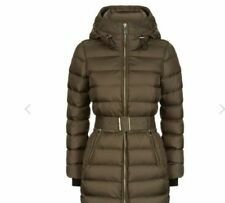 Brit puffer - This has the puffer insulation that you see in the other Burberry quilted jackets. Two large pockets are convenient for storage, and they have zippers to keep your belongings secure. The Burberry Brit emblem is tastefully displayed on the back, and the company's check pattern inside the vest is a great way to showcase style. To bring in the vest at the waist for a slimmer profile, a drawstring on the inside of the vest can be tightened. Under each arm, a stretchy, mesh-style fabric is included to provide greater flexibility. Vest with a diagonal pattern - Some of the items have diagonal lines rather than the more standard horizontal lines. One of the styles of vest has a lighter feel to it, with a diamond pattern, two front pockets, a front zipper, and the brand's checkered lining. Many of the vests listed above come in various colors. While black and navy blue are more commonly found, there are some vests that come in bright red, light blue, purple, and green. There's also the rainbow down-filled gilet vest. It has side slip pockets, a relaxed fit, soft fleece lining, concealed zip with snap closure, and a stand collar. What makes it stand out is its rainbow panels that start with red at the collar and make their way down to purple at the bottom. What types of sweater vests are there? For everything she is and all that she's helped you to be, buy gifts like Burberry Vests and show your mom you love her this Mother’s Day. Content provided for informational purposes only. eBay is not affiliated with or endorsed by Burberry.